The country prepares for the all-male pageant with more than 100 delegates competing from all over the world. 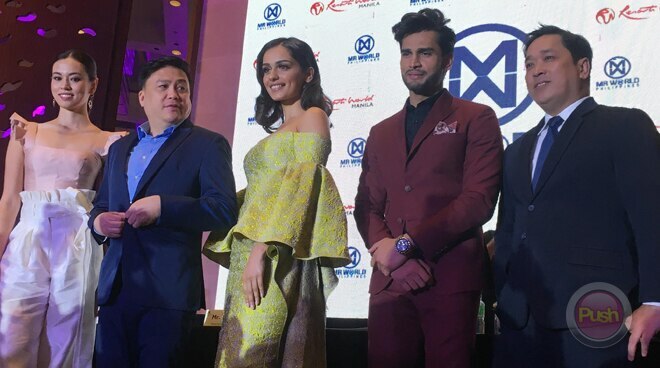 Last May 2 marked another milestone in pageant history with the announcement that the country will host its first Mr. World international pageant in January 2019. Since the pageant’s debut in 1966, the biennial event has been held mostly in European countries and only twice in Asia. According to Miss World Philippines National Director Arnold Vegafria, the Philippines is prime to host the pageant. “This is the right time to harness the collective strength of a united brotherhood of men; a time to take pride in our cultural diversity; to build bridges of cooperation and mutual understanding regardless of race, creed, or political persuasion. We are a country known not only for scenic tourist spots and natural wonders but also for being the cradle of beauty as represented by its wealth of world-class Filipina pageant titlists,” he shared. During the Mr. World press launch, Vegafria shared why Miss World Organization founder and CEO Julia Morley chose to hold the pageant in the country. “When I was awarded the franchise of Miss World Philippines by Julia Morley, I was inspired and challenged to discover a new breed of winning beauties. So far I think we have been successful with our humble mission. But despite these victories, I feel that we can do so much more even as we celebrate womanhood, I feel that we still have so much to do to truly fulfill the Miss World organization’s noble advocacy of beauty with a purpose. I am very proud to show the whole world the beauty and the grandeur of our country. We have so many scenic tourist destinations, beaches, and dive spots that have become renowned all over the world,” he explained. The pageant, which will have over a 100 male candidates flying in early next year to compete in the two- to three-week competition which features a series of challenge events, is more than just a beauty contest. “The Mr. World is more than just a search for the world’s most desirable man. After all, of what use are good looks, brains, and brawn if they are not compelled to action by a charitable heart and a kindred spirit. We call upon a new breed of young men to look beyond their vanity and pride and channel all energies to more meaningful and purposeful action,” Vegafria shared.